This list, for us, could equally be characteristics of ‘thinking mathematically’. In 2012-13, the project took place in five schools. All these schools wanted to develop more creativity in their teaching of mathematics. The project teachers in these schools meet six times a year and Alf made visits to their classrooms between one and three times a month. On these visits Alf sometimes took lessons and sometimes observed the teacher. There were always reflection meetings afterwards and discussion of what to do next. In all five schools, students were offered the challenge of ‘becoming a mathematician’ and it has been noticeable in lessons that teachers were emphasising ‘noticing pattern’ and ‘asking questions’ to students. One tool that was used in all schools is the Gattegno tens chart (see Figure 1). Different numbers of rows of the chart can be offered to learners at appropriate times (for example, in Year 1, the chart used may not include any decimals). It is possible initially to use the chart to work on saying numbers and then counting up or down in different numbers. Try counting up in 3’s, pointing each time (to 3, 6, 9, 12) – a class might be chanting responses as you point (12 would be signified by pointing to 10 and then 2). Now try counting up in 30’s, or 300’s. It is apparent that a very similar pattern is being followed. Students can gain access to the structure of the number system. It is also possible to introduce multiplication and division by 10 using the chart. Point to a number, the class chants back the number 10 times as big. A discussion at some point can establish that multiplication by ten is equivalent, on this chart, to moving down one row. Multiplication by 100 is moving down two rows; division by 10 and 100 can be introduced immediately as the reverse processes. Students can be supported to function smoothly with these new mathematical symbols, x10 and 10, without needing to memorise anything beyond the visual movement up and down the chart. See here for more activities linked to the chart. In this article, I exemplify a project in one school, that lasted over four 1-hour sessions. I had been asked to support the students in working on multiplication and division. The school is a rural state primary school, with levels of attainment broadly in line with national averages. We began chanting using the chart, in a manner described above. After working with the students on how to multiply and divide by 10 and 100, a challenge was offered, to choose a number on the chart, go on a journey multiplying or dividing by 10, 100 and to get back to where they started. The examples of students’ responses to this task below are taken from a mixed Year 3-4 class (ages 7-9). This student has completed three journeys and ticked their own work since they have recognised that they got back to where they started. In the project, teachers have emphasised to students the need to write down anything they notice and any questions they have. 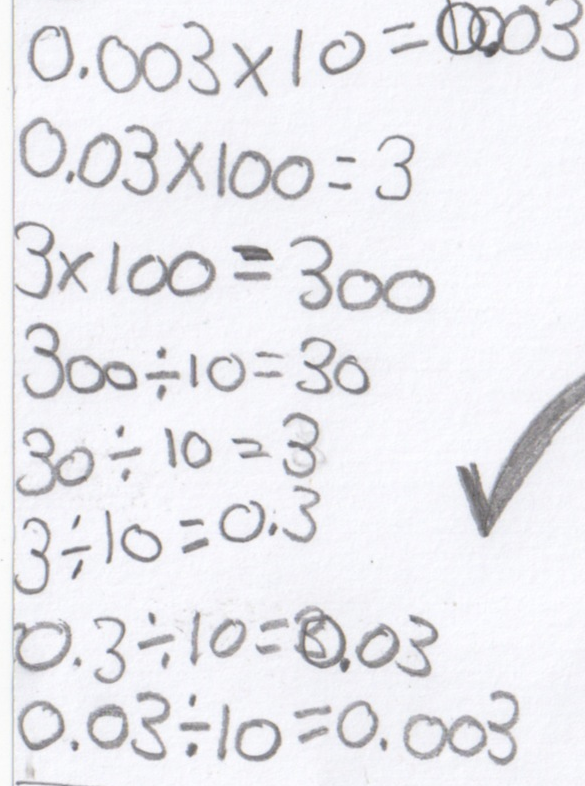 For example, in Figure 3, a student has written: “I’ve noticed it is clever because if by 10 you x 10 then get back”. Figure 3: A connection made! This student is expressing a key awareness, and offers an example of the connection between multiplication and division. Several students went beyond the operations that had been shown to them, involving 10 and 100. The student below was challenging herself to go on a journey and return in one step. 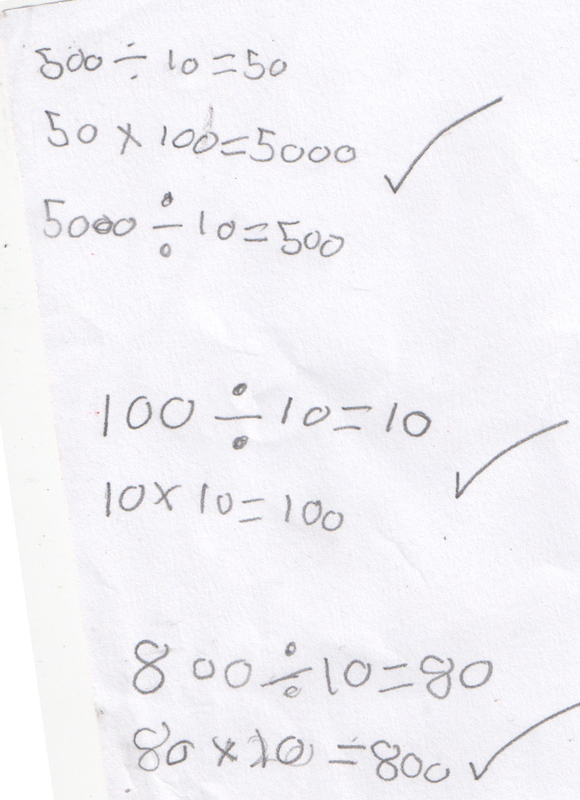 There is evidence here of the student extending the pattern of how to divide by 10 and 100, to work out what she must do as the inverse of x10, x10, x10, x10. The structure of the tens chart meant that there was little difficulty for students in extending what they had done with journeys in whole numbers, to journeys into decimals. At the end of the second lesson, one student asked if they could make a journey from one column to a different column (all journeys to this point had been in a single column of the chart). As teachers and researchers we had not expected this question and never used the chart to do this. However, we took on the challenge and in the third lesson, Alf offered the idea that to go from, say, 7 to 4 on this chart, since we only use multiplication and division, we would have to divide by 7 to get to 1 and then multiply by 4 to get to 4. With this new possibility, students were then challenged to choose a starting point and a different end point for their journeys. Although there is a small error in the last line, this student demonstrates a striking control of the symbols she is using. This student was seen by the school as having low levels of prior attainment. One of the teachers, in reflecting on this particular project, commented on how she had always, previously, approached multiplication through a concrete manipulation and grouping of objects. In this treatment, we have observed students being able to begin with a visual tool that is already abstract (the tens chart) and build further abstractions on top of it. At some point, of course, they will need to connect their use of multiplication and division with real objects, but in this treatment it appears that students are able to work with numbers (e.g. 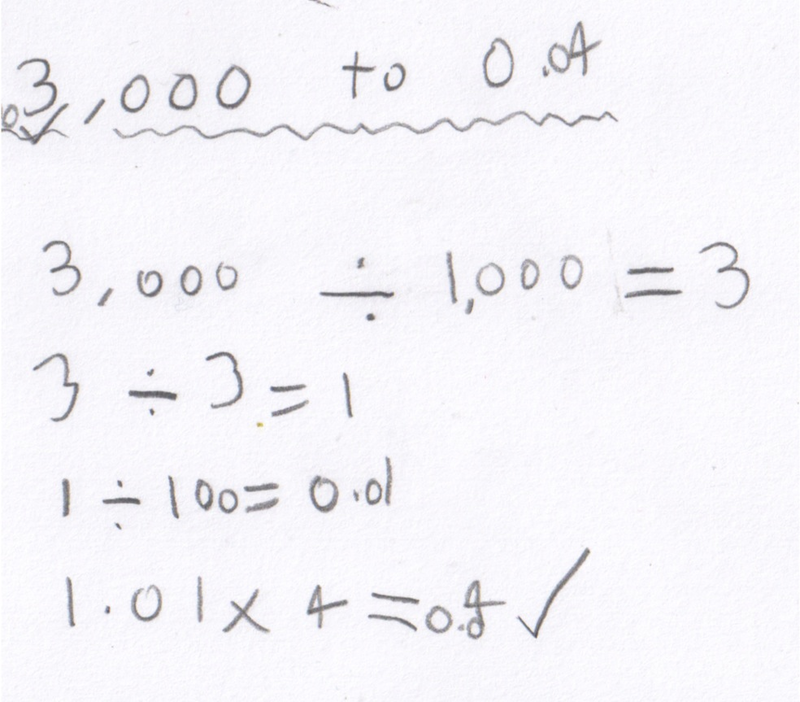 decimals) and operations (e.g. division by 10,000) that would not normally be introduced until later in the curriculum in the UK. The work on journeys supported students in gaining awareness of the inverse relation between multiplication and division (Fig 3); awareness of place value (without this being explicitly mentioned, e.g., Fig 4); and, in the work moving between columns (Fig 6), the beginnings of the ‘unitary method’ for solving problems. We make no claims about what students do or do not understand about multiplication and division. What we observe is that they have become energised by gaining fluency in symbolic manipulations and have developed awarenesses linked to these symbols.